For the tennis tournament, see Queen's Club Championships. The Queen's Club is a private sporting club in West Kensington, London, England. The club hosts the prestigious annual Queen's Club Championships grass court men's lawn tennis tournament (currently known as Fever-Tree Championships for sponsorship reasons). It has 28 outdoor courts and eight indoor. With two courts, it is also the national headquarters of real tennis, hosting the British Open every year. The Queen's Club also has rackets and squash courts; it has now become the headquarters for both these sports due to the Prince's Club closure in 1940. Founded as The Queen's Club Limited on 19 August 1886 by Evan Charteris, George Francis and Algernon Grosvener, the Queen's Club was the world's second multipurpose sports complex, after the Prince's Club, and became the only one after the Prince's Club relocated to Knightsbridge and lost its outdoor sports facilities. The club is named after Queen Victoria, its first patron. On 19 May 1887 the first lawn tennis courts were opened and on 1–2 July 1887 the first sporting event was held when Oxford played Cambridge. The construction of the club buildings took about eighteen months and they were opened in January 1888. William Marshall, finalist of the inaugural 1877 Wimbledon Championships was the architect. Among the initial sports offered at the club were real tennis, Eton Fives, rackets, lawn tennis (grass courts and covered courts), football, rugby and athletics. Cricket was also played but not as an organized sport. The University Sports meeting between Cambridge and Oxford was held at the Queen's Club from 1888 to 1928. Queens Club was the venue of the covered courts (indoor) tennis, jeu de paume (real tennis) and rackets events of the 1908 Summer Olympics. Until 1922, the club was the main ground for the football games of Corinthian F.C. One international was held, England drawing 1–1 with Wales on 18 March 1895. 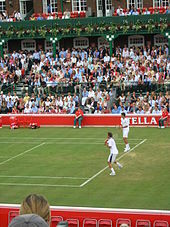 On 13 September 2005, the Lawn Tennis Association (LTA), the governing body of British lawn tennis, which had owned Queen's since 1953, put the club up for sale. The terms required that the rackets club and the Queen's Club Championships remain unaffected (the site's value for residential or commercial redevelopment might greatly exceed its value as a sports club, in the event that planning permission could be obtained, and the LTA wished to preserve the club's role in British tennis). 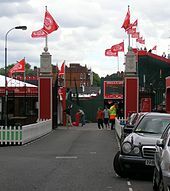 On 8 March 2006, the LTA announced that it would sell to club members for £45 million, ending seven months of uncertainty about the club's future. However some members disputed the LTA's right to sell the club, which they contested it merely held in trust on their behalf, and began to raise funds to dispute the sale in court. In December 2006 the two sides reached an out of court settlement in which the sale price was reduced to £35 million. In February 2007, the LTA relocated its headquarters from Queen's Club to the new National Tennis Centre in Roehampton. The Aegon Championships still remains one of the six most prestigious grass competitions on the men's ATP tour along with the Gerry Weber Open in Halle, Germany, the Aegon International, the Hall of Fame Tennis Championships in Newport, Rhode Island, the Rosmalen Championships in the Netherlands and Wimbledon. The ball girls are selected from year 8, 9 and 10 pupils at St Philomena's Catholic High School for Girls and Nonsuch High School. ^ McKelvie, Roy (1986). The Queen's Club Story, 1886-1986. London: Stanley Paul. p. 13. ISBN 0091660602. ^ 1908 Summer Olympics official report. pp. 220 (covered courts tennis), 233 (rackets) & 314 (jeu de paume). ^ Bloomberg. "London's Queen's Club Sold to Members for 45 Million Pounds". Archived from the original on 7 May 2006. Retrieved 25 April 2006. ^ Mark Hodgkinson (9 June 2005). "LTA legal threat from Queen's Club rebels". The Telegraph. ^ "LTA sells Queen's Club for £35m". BBC. 14 December 2006. ^ "LTA end Queen's Club dispute". The Telegraph. 14 December 2006. This page was last edited on 7 April 2019, at 23:09 (UTC).